Meet the exceptional Guest Services team as they welcome you to the perfect seaside escape 24 hours a day, right here at Meriton Suites Broadbeach. Have our friendly porters assist you with your bags and prepare yourself for a stay full of fun, comfort and luxury. Towering over the Gold Coast at an impressive 32 levels tall, guests will be mesmerised by the sparkling ocean blue water, reaching as far as the eye can see. Breathe in the fresh sea breeze right from the comfort of your very own Ocean Suite, or experience the serenity of the scenic hinterlands in our Modern Suites, both of which are equipped with balconies. Space and comfort is a necessity when travelling with a large group of friends or family and all 405 of our suites provide just that. Designed to deliver maximum comfort, our suites are up to three times larger and promise better value than the typical hotel room, with our 2 and 3-bedroom suites fitted with a full second bathroom for added convenience. Also featuring stylish and sophisticated furnishings, open plan living spaces and the necessary facilities, including an internal laundry, our accommodation promises to deliver an ultimate and memorable holiday experience on the Gold Coast. Experience ultimate resort style facilities with both an indoor and outdoor lap pool, spa, sauna and a well-equipped gymnasium. Stroll around lush, green, tropical-themed garden beds, host your own Aussie BBQ in our barbeque area or soak up the sun by the poolside sundeck, with your favourite read and coffee from the onsite coffee cart in hand. With both towers having undergone an exciting renovation over the past 18 months, guests can experience the ultimate beachside escape and enjoy unparalleled comfort in the newly, refurbished suites. Yes. 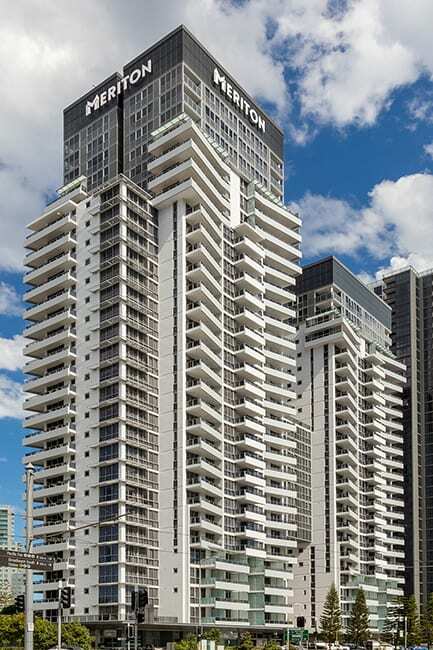 All Meriton Suites locations offer guests complimentary High-Speed internet in your suite and hotel shared areas.